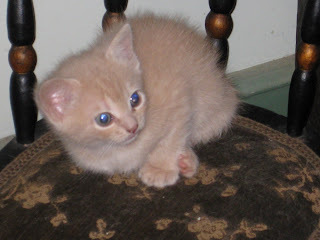 This is one of the 2 sweet buff colored kittens we have up for adoption....5 weeks old and could not be CUTER ! I would keep them all but alas ,we already have all we can handle...NEED A KITTY OR TWO ? 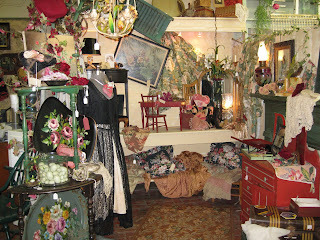 One makeover always leads to another....This is my booth...can you tell I LOVE COLOR ! 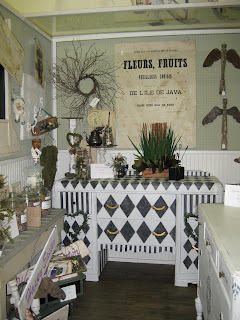 Tole Trays are one of my FAVORITE things....Lots of Vintage fabrics.... Now the reason for the makeovers...I am going to do a new booth with VINTAGE supplies ...the hard to find stuff we all look for when we CREATE ! Coming Soon....A LITTLE BIRD TOLD ME HOW ! 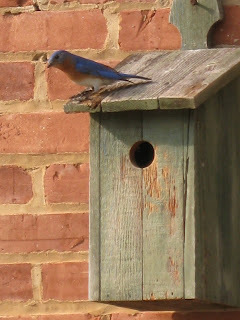 We have the sweetest pair of Blue Birds feathering their nest just outside our shop door! Yesterday they came in to look around...on nice days I leave the shop door open... We feel so BLESSED. My Roses are so BEAUTIFUL I had to share them... I planted them about 6 years ago across our front fence. Every year they get PRETTIER ! 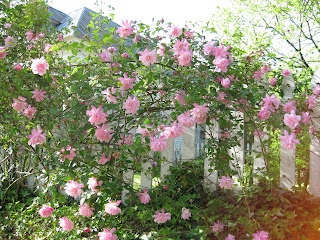 They came from the Antique Rose Emporium...Pink Blush.... God's Bouquet....Beauty in the Thorns. 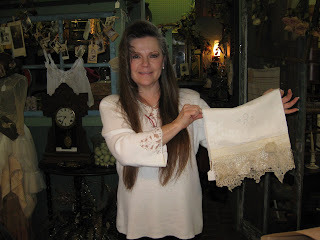 Sweet Linda Short from Belle Chasse Louisiana popped in today.... She was so excited to be here and SHOP in person ! She so wished her Sister could be with her.... Linda knows her sister would be as excited as she was ! Thank You, it's so much fun for us when Blogger Friends stop in ! 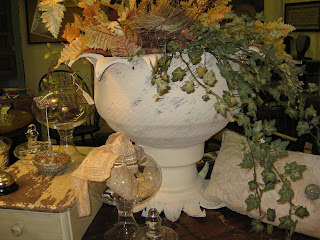 What a WONDERFUL Urn ! Who would guess it is an old tractor tire.... What a great way to go green...these tires never decay and planted up they look great ! Save the landfills girls .... I planted up two of them for my entry...So Unexpected ! Wishing you a BLESSED EASTER ! Celebrating CHRISTS Resurrection , as we wait eagerly for him to come AGAIN ! 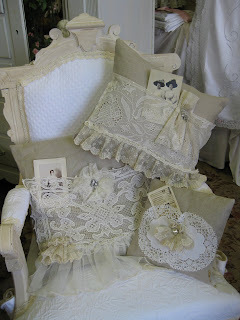 These are the SWEETEST Child's Bonnets.... 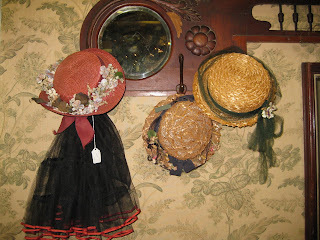 I can just imagine the sweet outfits that they wore with these.... Don't forget your EASTER Bonnet ! 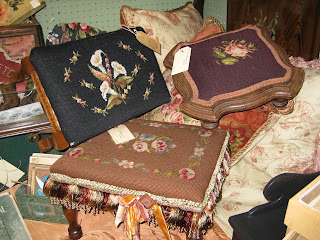 Precious Needlepoint Stools....The perfect accent ! These three are so neat... Wanted to add them to my nest but my KITTY'S liked them to much and I hate to see them ruined....BAD KITTY'S ! 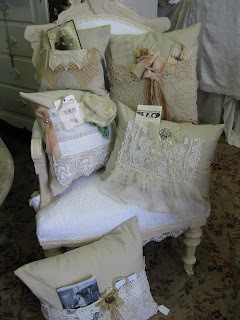 Cheryl was so INSPIRED by the beautiful pillows on Dream in Cream Blog... She created some of her own, each is so unique.... LOVE them all ! 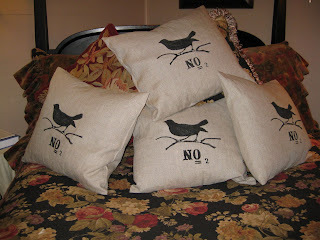 SORRY all these are SOLD..They RAN out the door...More to come soon! What a PRECIOUS gift... Denise at Samaritan Women has given me. She lifts all who read her Blog. CHRIST'S light shines through and around her !I am so honored that she passed it to me. Humbled really... 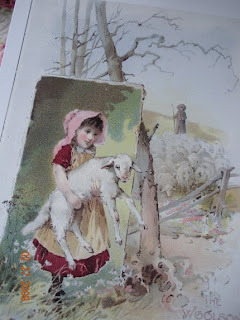 I want to pass this on to: Ann at- A Holy Experience This blog Lights my life every day, convicts me and also fills me with GOD'S love...A must for every believer wanting a deeper walk with the GREAT I AM ! And to Polly at Count your Blessings For inspirations daily, In all our struggles GOD reveals his BLESSINGS. 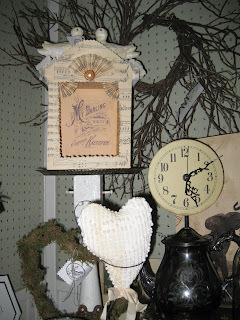 And to Marietta at- Sweet Old Vintage for her SWEET Spirit! 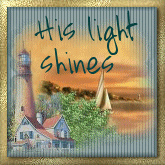 Keep Blogging Girls , You are CHRIST'S LIGHT and SALT ! Deliver this award to a few Bloggers who must choose a few more BLOGGERS and include the message...Thanks Mama Bear ! 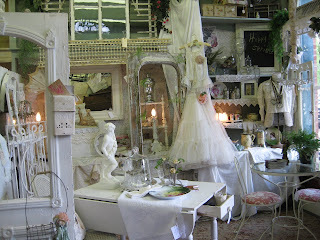 "These blogs are exceedingly charming. These kind bloggers aim to find and be friends. They are not interested in self-aggrandizement. Our hope is that when the ribbons of these prizes are cut, even more friendships are propagated. Please give more attention to these writers.